The fruit is in oblong shape with smooth yellow rind, but occasionally few netted. 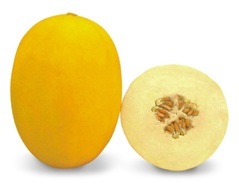 Fruit weighs around 1.5-2 kg, with tender white flesh, and has ugar content of 14-17%. It can be harvested around 65-75 days after sowing.